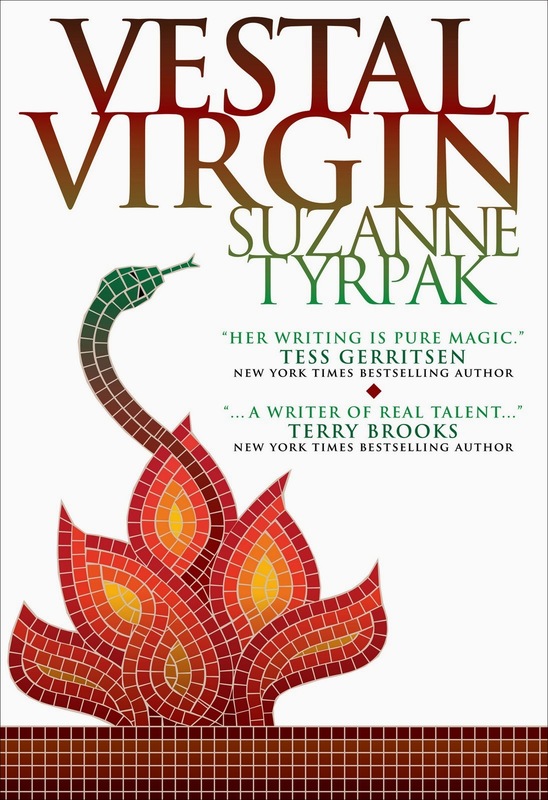 A priestess in Nero’s Rome discovers hidden truths about faith and herself, in Suzanne Tyrpak’s Vestal Virgin. The Emperor dictates the fate of Rome citizens, but when the priestess Elissa Rubria Honoria rejects his manipulation, a chain of events follow that endanger Elissa and everyone she cherishes. As calamities befall her, she also uncovers long-buried secrets about her past. In Elissa’s childhood, her parents surrendered her to the care of the Vestal Virgins, honored women bound by vows of chastity to serve the Roman goddess of the family and family. While Elissa did not willingly accept the burden, she achieves a semblance of security and comfort in later years. Her carefully scripted life begins to unravel when she learns that her brother Marcus faces an accusation of treason. Elissa knows the Emperor Nero is a capricious and dangerous man, but in her desperation, she believes she can save her brother. She rushes off to the Circus Maximus, where Nero has ordained Marcus’s death as a spectacle for Rome’s citizens. On her journey, Elissa meets a stranger whose prophetic vow will haunt her. Though Nero toys with Elissa upon her arrival, it is soon clear that he does not intend to release his victim. Afterward, Elissa begins to question the will of the gods, who have allowed Nero’s cruelty to go unchecked. As a Vestal, Elissa has sacrificed a future with the soldier Justinus, but it seems she will have to endure much more given the loss of her brother. Her family remains subject to the Emperor’s whims, especially her younger sister Flavia, who seems to have caught Nero’s eye. It is a horrifying prospect for Elissa and the Empress, Poppaea Sabina. Where Elissa is selfless, Flavia’s selfishness threatens to embroil the family in Nero’s schemes. The Emperor, who once deemed Marcus and Justinus his friends, has grown into a paranoid monster, leaving Justinus fears for his life. Through him, Elissa makes a connection with Paul of Tarsus, one of the followers of Jesus, an act with grave consequences for everyone involved. As Elissa tries to reconcile her faith with the tenets of the new religion, Nero, Flavia and Poppaea pursue their own schemes, each of which will ruin Elissa’s former contentment, but also aid her in uncovering an unexpected connection between her and the Emperor. The authenticity with which Ms. Tyrpak writes about ancient Rome will make readers feel as though they are walking the crowded, smelly streets or mingling with the masses in the arena. Her character portrayals reveal flawed and misguided individuals, who are also sympathetic even at their most foolish. The author does not shy away from the reputed cruelty and vagaries that the Emperor Nero displayed during his lifetime, and she succeeds in making him a powerful antagonist, even when he seems comical. There are hints of sexual perverseness, but nothing too explicit. While I won’t give away the ending, it felt as though some of the conflicts remained unresolved. I’m pleased to hear that there is a sequel to Vestal Virgin.